The casino chain's stock moved higher as the company announced new expansion plans. A rendering of Paradise Park. Image source: Wynn Resorts, Ltd.
What: Shares of Wynn Resorts, Limited (NASDAQ:WYNN) were in the money today, gaining 10% as of 11:04 a.m. ET after the company announced expansion plans and an analyst upgrade. 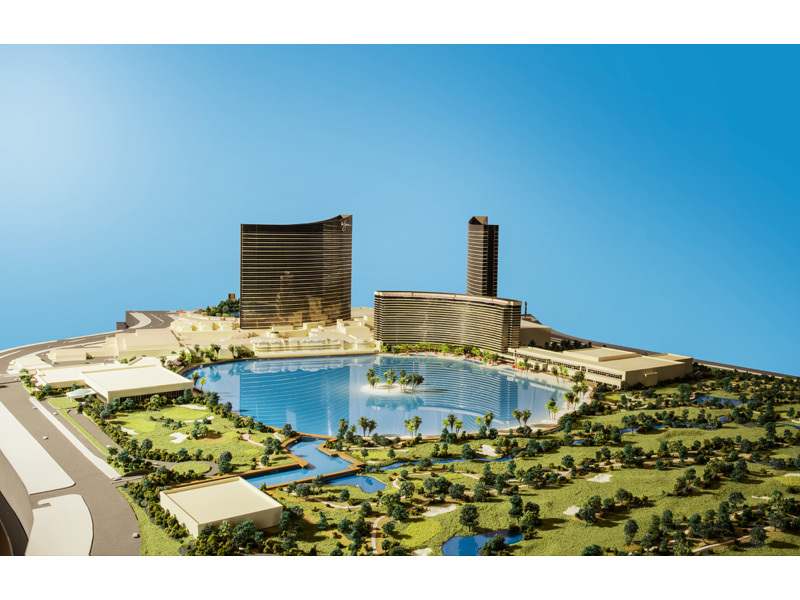 So what: The casino operator last night presented plans for a new 1,000-room resort on a lake in Las Vegas, tentatively called Wynn Paradise Park. The resort would be the only lakeside destination of its kind in the gambling capital. The company plans to take 130 acres from the Wynn Golf Club to build the new resort. According to CEO Steve Wynn, "We have a chance to reinvent Las Vegas and make the whole venue an entertainment attraction… an idyllic beach paradise surrounded by white sand beaches. People come to Las Vegas from all over the world to live large and have a good time and we can dish up an irresistible entertainment attraction." Now what: As a result of the move, Telsey Advisory Group upgraded the stock to outperform. The uniqueness of the new resort, which would include activities such as water skiing and paddle boarding could bring in between $300 million and $400 million in EBITDA, according Telsey analyst David Katz. Wynn estimates the project could cost as much as $1.6 billion. At the investor event, Wynn also said that its property in Macau would open in July and August, and said another casino is on the way in the Boston suburbs. The gaming business comes down to properties, and the three above are expected to drive around $1 billion in EBITDA for the company, more than justifying today's gains as the market cap grew by about $1 billion.